I love to experiment and try new ideas in the kitchen. I’ve had many failures along the way, but because my mistakes often are remade into a “masterpiece” later I don’t give up on trying new things. 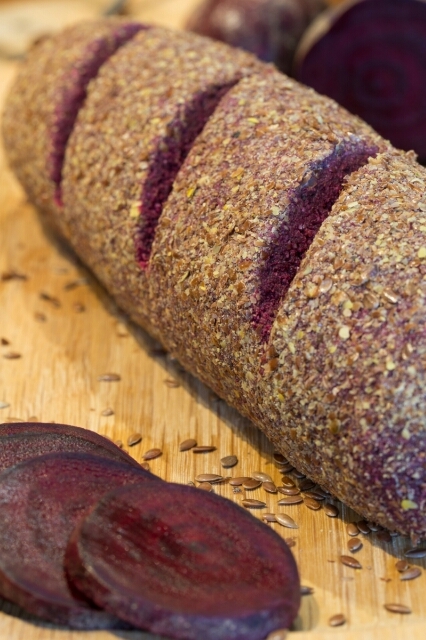 Beetroot + crunchy bread how can that duo not be perfect together? I’ve made this crunchy bread a few times, and it’s always turn out SENSATIONAL! 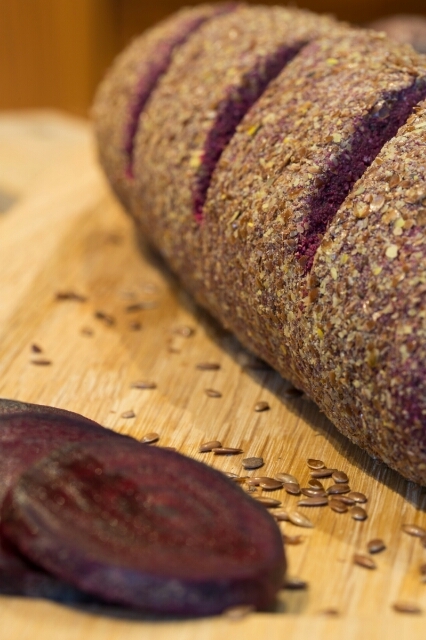 I think the hardest part about following a healthy vegan or a raw food diet is bread. Yes, finding a bread free from unneeded sugar, artificial flavors, artificial colors, and GMO products (put quite simply – nutritionally rubbish) that also vegan, can be challenging enough. So if it’s not that … make your own, and why not? Not nearly as complicated as it looks, once you master the balance of the base, honestly – the sky is the limit as to what combination of vegetables, seeds, nuts and herbs you can use. Okay, so if you’re a health-conscious bread eater try this easy recipe for a quick and easy Bread Roll. 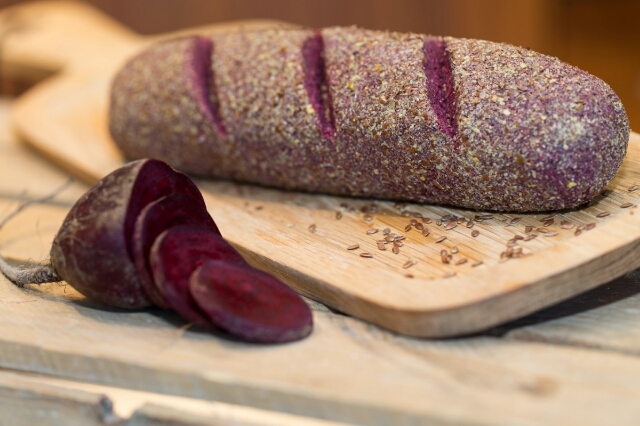 The bread has a wonderful slightly nutty taste, crunchy on the outside, soft on the inside with a delightful flavour that is gluten-free and oil-free as well! 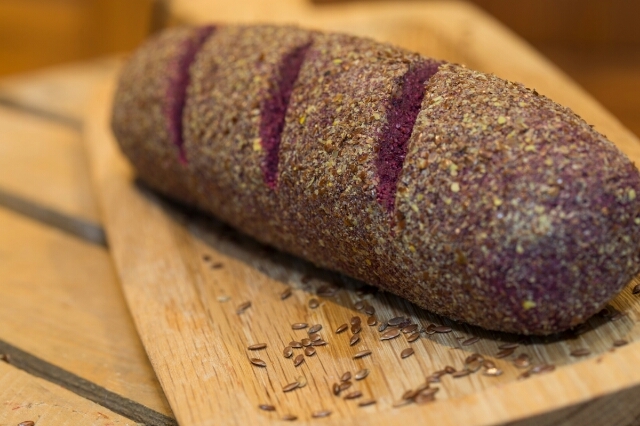 Full of healthy goodness, and smells like happiness, what more can you ask of a raw bread. A good alternative to bread for sandwiches. Yes, you can enjoy a fabulous bread whilst living a RawVegan Lifestyle! 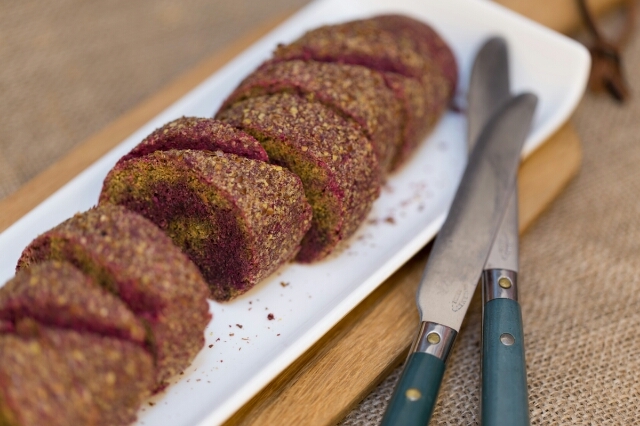 This simple recipe makes one tasty and wonderfully healthy raw vegan bread roll. Okay, now let’s get started! process until well combined. Remove dough and form into a small loaf or bread roll (longer and thinner is better so the drying process take shorter amount of time) or your preferred shape. Roll with coating of your choice, I used ground flax seeds. Dehydrate at 140°F for 2 hours. Decrease heat to 115°F and continue to dehydrate about 8 -10 hours or until dry. It can also be sped up a little, to make the total time as little as 10 hours by slice the bread and place slices on dehydrator sheet. This baguette is definitely best served warm, right out of the dehydrator, so enjoy it immediately. 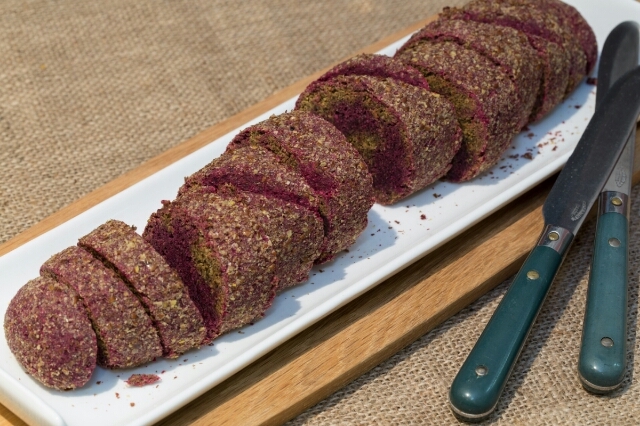 Using the same recipe, you also can try making veggie pulp bread roll. Remove dough and form into a small loaf or bread roll (longer and thinner is better so the drying process take shorter amount of time) or your preferred shape. Roll with coating of your choice, I used ground flax seeds. Dehydrate at 140°F for 2 hours. Decrease heat to 115°F and continue to dehydrate about 8 -10 hours or until dry. It can also be sped up a little, to make the total time as little as 10 hours by slice the bread and place slices on dehydrator sheet. Just a question..curious..why you call it beetroot, rather than just ‘beet’? I’ve been seeing that lately, and in all my years have never heard anyone refer to beets as beetroot until lately. So, I was wondering if it was a new trend; or maybe you were not from America,…(??) Just wondering. Anyway, it looks insanely wonderful! 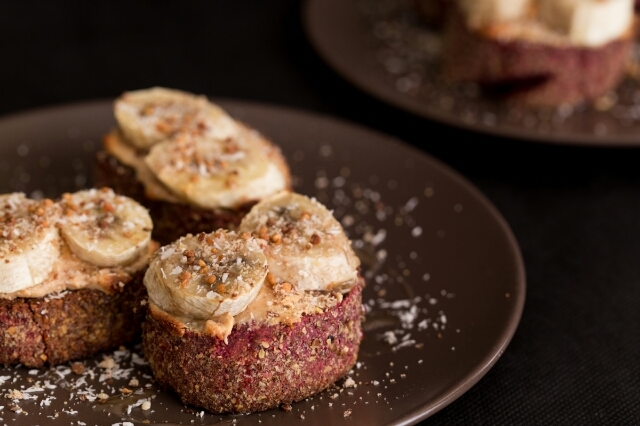 I happen to absolutely LOVE beets and collect recipes made with beets. I’ll bet this tastes amazing. Although I am not used to eating raw, I’m absolutely loving all the creations you come up with! Very exciting to look though your posts, you are very creative!! Hi Stephanie, I’m so behind on comment response, I’m sorry! Thank you so much, you’re so kind!! I’m so happy you liked them and hope you enjoy your journey into raw foods.